Abraham Owen Smoot I, the first President of the Board of Trustees of Brigham Young Academy in Provo, Utah, served on Board of Trustees from 1875 to 1895. Abraham O. Smoot I, Chairman of the Board of Trustees of Brigham Young Academy, was the indominable force behind the Academy. He served first as mayor of Salt Lake City, then as mayor of Provo. His leadership involved almost every facet of the development of the whole territory and its rapidly expanding population. When Brigham Young died in 1877, the leadership of BYA fell heavily on Smoot, acting as liaison between a dubious but hopeful public, and an ambitious, driving leader in Karl G. Maeser. He gave his life and his fortune to build up the Academy. In his last days he assumed the debts of BYA amounting to more than $100,000. He mortgaged his properties and holdings to liquidate them. A wealthy man, he died practically penniless to save the honor of the Church and the Academy. After he died on March 6, 1895 at the age of 80, over 5,000 people came to the Provo Tabernacle to pay honor to him. The Academy had its origins in various locations. As the Dusenberry School, it started in an adobe building on First West and Center Street. The school was later moved to the Lewis Building on Third West and Center Streets. On Sunday evening, January 27, 1884, a fire, which started in the chemistry lab, completely destroyed the Lewis building. On a call from founder and principal, Karl G. Maeser, the following morning, A. O. Smoot I, faculty and students fitted up quarters in three temporary locations: a Provo meeting house, the First National bank in a business block completed by Smoot, and a new store belonging to S. S. Jones. During the summer, the ZCMI warehouse, located at the south end of University Avenue, was remodeled. School was held there until January, 1892, when the structure known as the High School Building, and later Education Building, or BY Academy Building, was completed. Located at the northern edge of the city, the large new building was constructed of locally manufactured brick trimmed with sandstone and wood. The roof was composed of metal shingles. The large structure had 2 main floors, a basement and an attic. Electricity generated at Abraham O. Smoot's sawmill two blocks to the west provided for electric lights in the building. Heating for a portion of the building was accomplished by forced air over steam radiators; the remaining rooms were heated by coal stoves. He married all five wives before he became Mayor of Salt Lake City. Abraham Owen Smoot I was born February 17, 1815 in Owenton, Kentucky, to Ann Rowlett and George W. Smoot. His father died when he was less than six years of age. His mother in 1835 became a convert to the Mormon Church through the influence of missionaries who were then traveling in northern Kentucky. On March 22, 1835, he was baptized by Elder Warren Parrish. Wilford Woodruff also enjoyed considerable success in Smoot's neighborhood, in the Blood River, Tennessee, area. During the next year, Smoot joined Woodruff in performing missions throughout Kentucky and Tennessee. Then the pair traveled to Kirtland, Ohio, church headquarters, to participate in classes in the Kirtland Temple. They arrived in Kirtland on November 25, 1836, where they stayed with Warren Parrish. Parris in turn introduced Smoot to Joseph Smith. While in Kirtland, Smoot studied Greek and Latin during the months of December and January. Near the end of his brief stay in Kirtland, Joseph Smith advised Smoot "to help gather the Saints to Far West, Missouri." Abraham returned to Tennessee where he convinced members of his family to join the migration to Missouri. With the company encamped along the Ohio River, Smoot left the party to collect other members and acquaintances living in Kentucky and Tennessee. On the 24th of April, Smoot shepherded another small group toward the Ohio River. On departing Tennessee, Abraham Smoot penned a new legend into his record, reading, "A Journal of A O. Smoot 's Travels in the ministry in the year of our Lord 1837 this the 24 of April AD 1837." [24 April 1837] "Monday I started in company with Father S. Hendrick [Hendricks] R. A. Alexander L. Brady who pitched their tents for the land of Zion we traveled 14 m pitched our tents 6 m[iles] south of Mayfield County seat of Graves County[, Kentucky]�." During this phase of the trip, Smoot enjoyed the company of his betrothed, Martha McMeans Adkinson. Martha, a widower, left her family and friends behind. She had been betrothed to Smoot previous to the trip to Missouri. [Caroline Rogers Daniels Smoot, "A Short Sketch of the Life of M. T. Smoot," L. Tom Perry, Special Collections Library, BYU.] Margaret's young son also accompanied her on the trek to Missouri. "30 [May] Tuesday [the company] traveled 17 m[iles and] arrived at John Freemans on Shool [Shoal] Creek [at] Walker Ford." The party spent an extra day at this location, as it appears Freeman was Smoot's brother-in-law. "31 Wednesday [we] lay by at Brother Walker['s on] Shoal Creek." "June 1 1837 Thursday traveled 22 m[iles] arrived at Br Camps on Long Creek Caldwell County Missouri�"
"I accordingly went South, and in the month of May had succeeded in organizing a company of two hundred souls with about forty teams and started on our journey. The trip occupied about two months. We immediately set about making homes and soon began to get comfortable surroundings." [A. O. Smoot, "Early Experiences of A. O. Smoot," Early Scenes in Church History (SLC: UT: Juvenile Instructors Office, Eighth Book of the Faith Promoting Series, 1882), 19. Levi and Ann Taylor seem to have located in Colfax Township, in Daviess County, about 12 miles north of Far West. Abraham and his brother Reed must have resided with them during the fore-part of the winter. 15 Lexington bought a pair of boots at Masons Store north street distance 11 m spent the night at Mr Payes?" As relations with surrounding non-members steadily soured, Smoot probably became a participant of the Daviess wing of the Danites. They played a role in the defense of the church. Smoot's journal provides a glimpse of his experiences during this the Mormon War. ". . . they [the Saints] were at this time in peace with all men, and so desired to continue. But Oh! the scene changed. It was no longer than the first of August when the hoof of the warior's [sic] horse was heard in our land, and our peace was changed unto scenes of war and confusion, and instead of hearing the sound of the hammer and plow our ears were pained by the deadly sound of fire arms and henious [sic] yells of the surrounding enemies. And thus finding myself engrossed in such scenes, it became my indespensable [sic] duty as well as my secret privilege to gird on my arms, yea my armour [sic] of war and unite my strength with that of my brethren, and go forth to the field of contention against our enemies, for the protection of our fathers, mothers, wives and children, our property, our houses and homes. And thus it became a continual round [of] invasion from our enemies on every side from the 1st of August until the first day of November, at which time we were compelled by superior force and traitorism to give up our arms and surrender. John L. Butler, one of Smoot's neighbors in Colfax Township, played a central role in the Election Day Battle at Gallatin, Daviess County. Joseph Smith immediately advised Butler to move his family to the Far West area after this episode. Butler also owned land two miles south of Far West. Smoot did not participate in the incident. However, John Butler recorded his impressions during the Gallatin fight. In the midst of such hardships, Abraham and Margaret found time for a bit of happiness for themselves. They were married in Far West on November 11, 1838. While they were "prisoners of War", the ceremony was performed by Albert Petty, Esqr. As the Militia began to withdraw, citizens of Far West were allowed to leave the city. The family of Smoot's former neighbor John Butler joined Abraham and Margaret at his farm in the Goose Creek neighborhood, two miles south of church headquarters. Smoot found that a party of the Militia has camped at his farm and slaughtered all of his cattle. Levi and Ann Taylor apparently remained in Caldwell County until they were able to sell their land in March 1839. A.O. and Margaret left Missouri in company with the John Butler family during the winter of 1838-39. ". . . the Saints were forced to sign a treaty, requiring us to surrender our arms sign over our property to assist in defraying the expenses of the war and immediately leave the State, which we done in the dead of winter going without even time to dispose of our homes and lands, which we had bought from and paid the government for with the means of honest toil. Note: Margaret Thompson McMeans Adkinson was born April 16, 1806, in South Carolina, the daughter of Anthony and Esther Hunter McMeans, of Chester County, South Carolina. Her father was a native of that State, while her mother was born in Scotland. By her first husband, William Cochrane Atkinson, she had one son, William Cochrane Atkinson, who took the name of "Smoot" upon his adoption by his step-father. Margaret was six years older than Smoot. Brief Biography: Smoot, Abraham Owen (1815-1895) -- also known as Abraham O. Smoot; A. O. Smoot -- of Salt Lake City, Salt Lake County, Utah; Provo, Utah County, Utah. Nephew of Daniel Rowlett and Joseph Rowlett; father of Abraham Owen Smoot (1856-1911) and Reed Smoot; grandfather of Abraham Owen Smoot III and Isaac Albert Smoot. Born in Owen County, Ky., February 17, 1815. Mayor of Salt Lake City, Utah, 1857-66; mayor of Provo, Utah, 1868-81. Mormon. Died in Provo, Utah County, Utah, March 6, 1895. 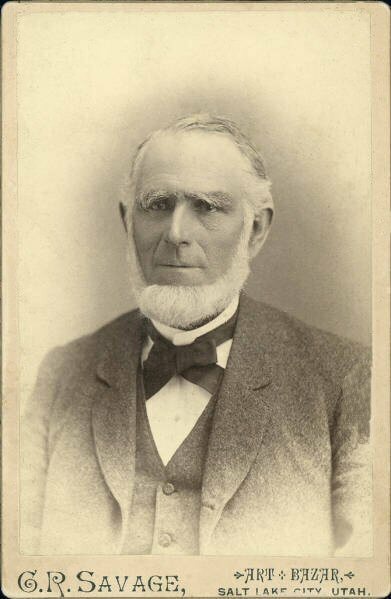 Abraham Owen Smoot was sent to Provo by Brigham Young in 1868, where he presided over the Utah Stake (all of Utah Valley) for 27 years until his death in 1895. He was also the first President of the Board of Trustees of the Brigham Young Academy (1875-1895) and is still the longest standing mayor of Provo. Despite steady growth during its early years, Brigham Young Academy was threatened by a series of financial and physical setbacks. With the help and sacrifice of Abraham O. Smoot, the campus moved in 1892 to new facilities located on University Avenue. A. O. Smoot I, a highly successful businessman, stake president, mayor of Provo, and Chairman of the Board of Brigham Young Academy, gave his buildings, his land, and mortgaged his home in order to save the institution. He died penniless, having given everything to the school. Smoot, in summary, was a dominant figure in the history of Provo and the state of Utah. He was described by his son-in-law, Orson F. Whitney, as "colonizer, financier, civic officer, legislator, missionary, Bishop and Stake President, who frequently sat with the leaders of the Latter-Day Saint Church."